About 15 animals were found dead in and around the home in Georgetown. GEORGETOWN, Texas — A Justice of the Peace on Wednesday awarded the 44 animals that were seized from a rural home in Georgetown to the Williamson County Regional Animal Shelter. Officials found 14 dead animals at the Georgetown home in July, the Williamson County sheriff said. On July 31, officials identified the suspect as Jeffrey Dollard. Officials previously said he was not yet arrested due to medical reasons. 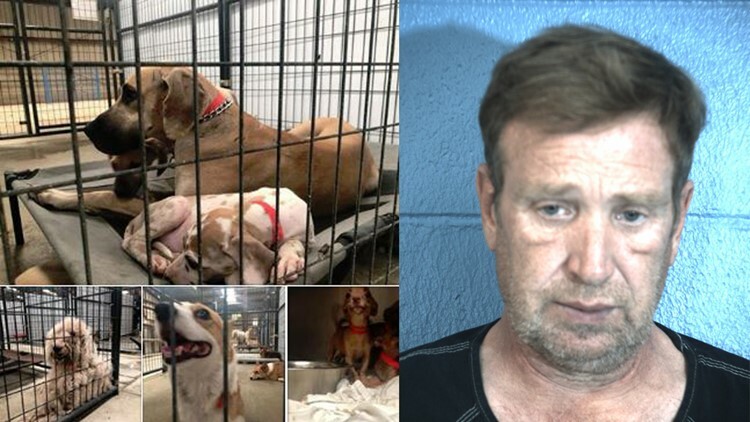 On Aug. 29, Williamson County Sheriff Robert Chody said Dollard was arrested and charged with 15 counts of cruelty to non-livestock animals. Jeffrey Dollard was arrested and charged with 15 counts of cruelty to non-livestock animals, the sheriff said. A family member of Dollard visited the home located on the 600 block of PVR 914 to feed the cats and dogs on July 24 at around 10:30 p.m., Sheriff Chody told the media. When that person arrived, they thought all the animals were dead and called authorities, Chody said. When responding deputies arrived, they found a total of 53 animals, ranging from dogs, cats, chickens, birds and a peahen, which is a female peacock. Two birds of some sort were beheaded, Chody said. Six dogs and cats were reportedly found decomposing inside the house in locked crates. "Some of them were in crates, cats were in the closet, I understand, without food or water, so there was some bad conditions for the animals," said Chody. After deputies entered the home, they called hazmat crews so the air quality could be monitored. "The stench was so strong that they just wanted to be safe," said Chody. The sheriff said the conditions inside every room in the home were "horrible." It is believed that the owner had been gone for at least two days, but the sheriff said officials believe the conditions were not caused within the owner's absence. "When you have the bodies of decomposing, petrified animals, that when you move them part of their corpse stays, the other part stays in the hands of the investigators trying to take evidence, it demonstrates to us they have been there longer than two days," said Chody. The sheriff said it appears there was neglect involved, and it's unclear if anyone killed any of the animals found. He said it is also unclear whether there was hoarding or breeding involved. He said the investigation is ongoing. A total of 38 animals were rescued from the home and taken to the Williamson County Regional Animal Shelter where they are currently being cared for. A Williamson County attorney says the animals can go up for adoption on Aug. 11 if the owner doesn't file an appeal. Staff will be conducting health checks on the animals, including 15 dogs, three cats, two cockatiels, one parakeet, roosters, hens, and a peahen with her eggs. Chody said 15 dogs were infested with fleas. Michelle Wolf lives near the home where the animals were seized. She said she was shocked by the news of what happened so close to home. "That's extremely disturbing because I have three wiener dogs, and I love my wiener dogs very much, and to hear that there's animal cruelty like that and I didn't even know it ... its right by my house," said Wolf.